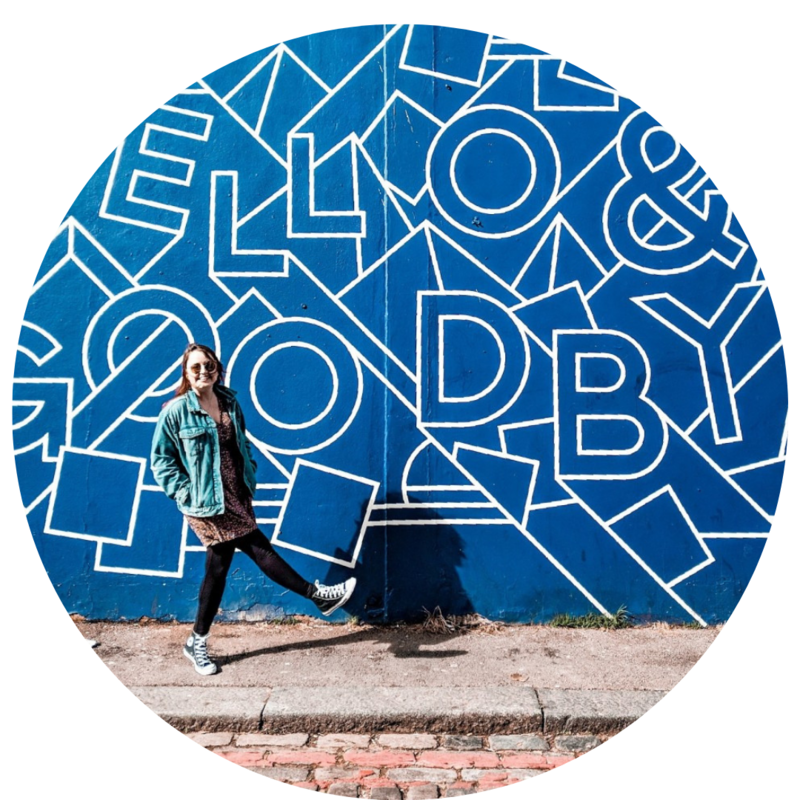 A lot of us are at the stage now where we holding down full-time jobs and squeezing our travels into our annual leave, due to this a lot of people often feel that they need to stay closer to home and cannot fit in a more exotic long-haul destination but you can. Travelling the world and maintaining a career is possible when planned properly multi-stop destinations are an option. 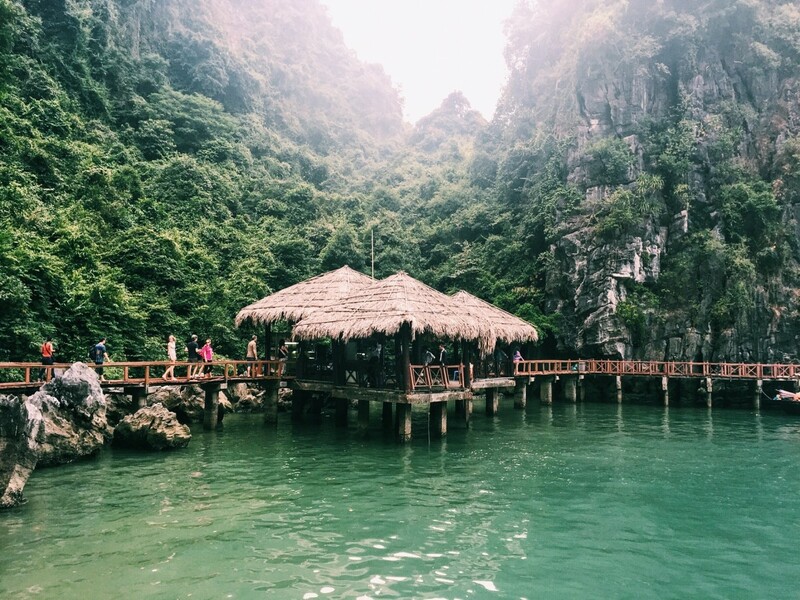 Last November I dived head first into a jam-packed 14 days in Vietnam; taking in the incredible landscapes, sampling the most delicious Pho and meeting some of the most beautiful welcoming people in the world. 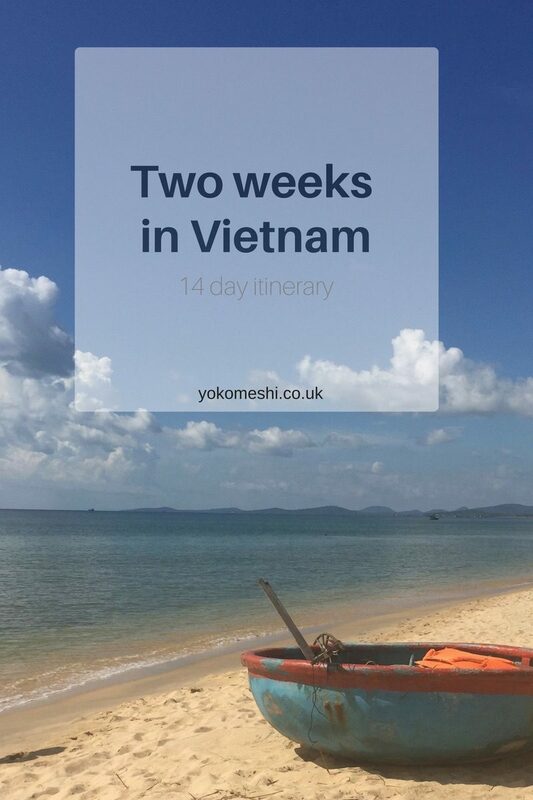 It may not be the most relaxing holiday in the world but 2 weeks in Vietnam is possible and completely worth it. 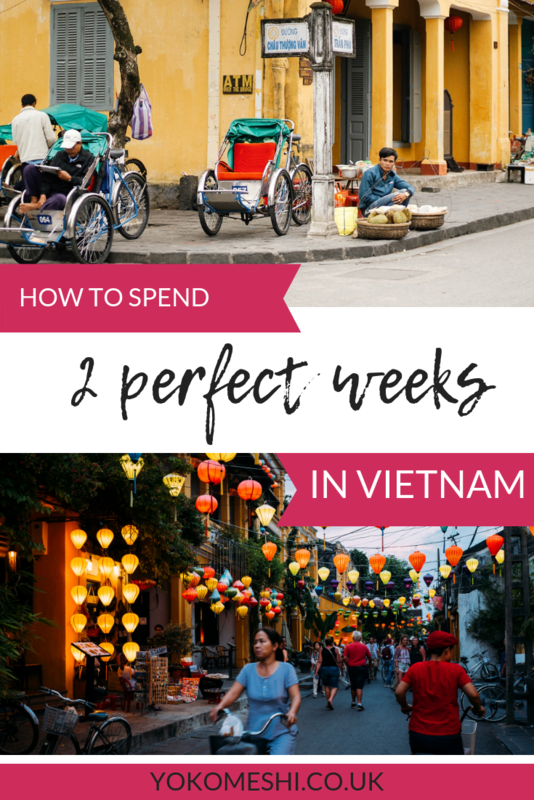 My two week Vietnam travel itinerary was fully planned by myself and my boyfriend, every part was booked separately by ourselves, this meant we also saved a lot of money by not going through a tour company for a prepared tour itinerary, it also gave us the flexibility to do exactly what we wanted during our two weeks in Vietnam – cities, beaches and sights. Important Vietnam Visa information: If you are staying 15 days or under in Vietnam you do not need a visa, however, ensure sure you have a print out of your departure flight for customs on arrival, you will not be allowed through until they see it. Internal flights around Vietnam are incredibly cheap (some flights are as low as £12!) and very frequent, while they may be slightly more expensive than sleeper trains or buses, they save A LOT of time, look up companies such as Air Asia and VietJet. Top Tip: Fly very early morning or very late evening, never fly mid-day as you will waste a day travelling. If you do want to travel by train, again book a sleeper train and travel through the night. How much should I budget for two weeks in Vietnam? What is Vietnam like for Vegetarians? The starting point for most people in Vietnam and the craziest but a definite must. Embrace the hustle and bustle, visit the war museums and try your best to not waste all day attempting to cross the road. Bui Vien street is the main ‘strip’ in Ho Chi Minh, here you will find the bars, restaurants, and clubs as well as all the backpackers. 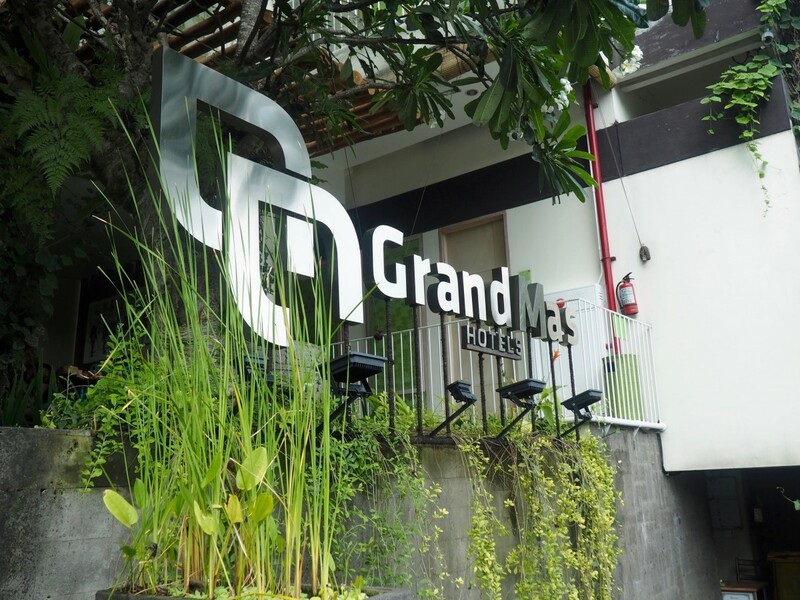 We stayed in the Meraki Hotel on Bui Vien street for the convenience of the location, but it is noisy until the early hours, so if you are a light sleeper I would recommend staying a bit further out. 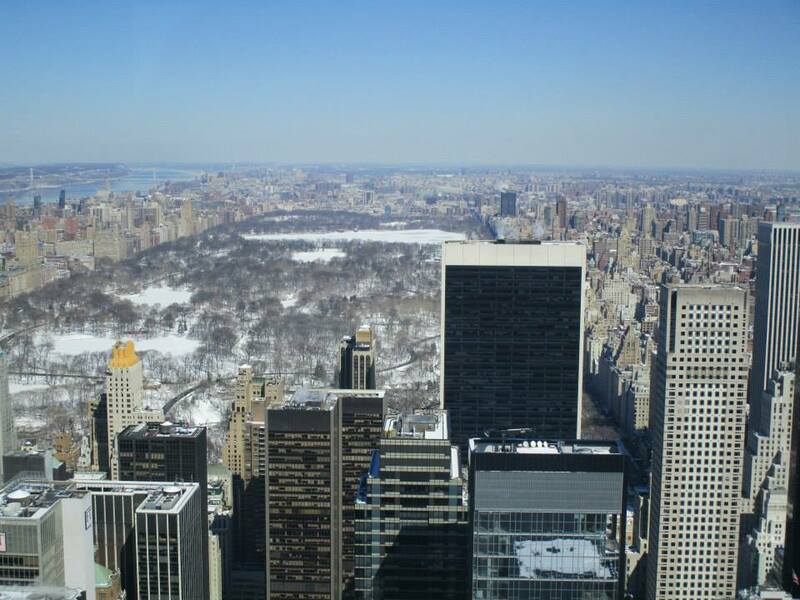 This hotel also has a rooftop terrace with amazing views over the city. From Ho Chi Minh you can take a day trip to the Mekong Delta River, I didn’t actually do this but I really regret it and wish we did. A few days of rest is essential for us on every holiday, even on travelling holidays, I think it is important for everyone to have a chance to recharge. 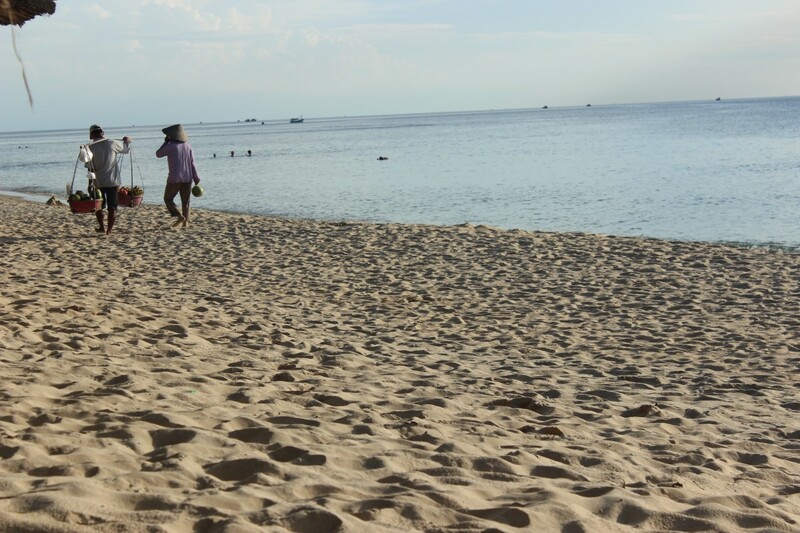 Phu Quoc was recommended to us by a member of our family, it is just west of Vietnam and actually closer to Cambodia. Phu Quoc felt like it hadn’t quite yet been hit fully by tourism, so was quiet and completely relaxing, although I did find the waters slightly polluted with rubbish in some areas, which was upsetting. 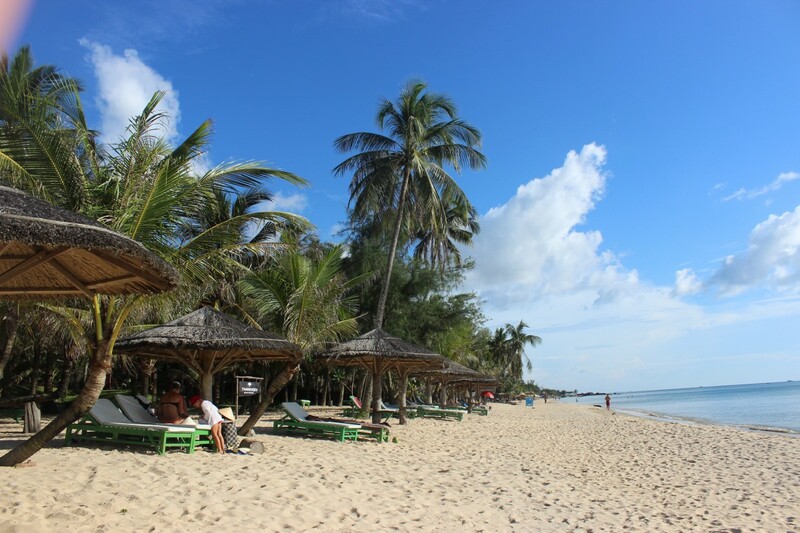 Phu Quoc is an idyllic beach destination. This collection of 28 Islands is surrounded by crystal clear water as well as an endless supply of pristine beaches. With vast reef networks creating shelter for a variety of sought-after species, marine explorers, scuba divers, freedivers, and spearfishermen will be in paradise. We stayed in Thanh Kieu beach resort which offers individual huts along the beach, if you stay in this area there is an awesome beach bar called Rory’s along the front run by an Australian couple, it serves great food, rents out kayaks and paddleboards and generally has an amazing atmosphere. We were pleasantly surprised by the islands’ vibrant and authentic local culture. It seemed many Phu Quoc residents still live traditional lives, paddling out into the ocean to fish each day. 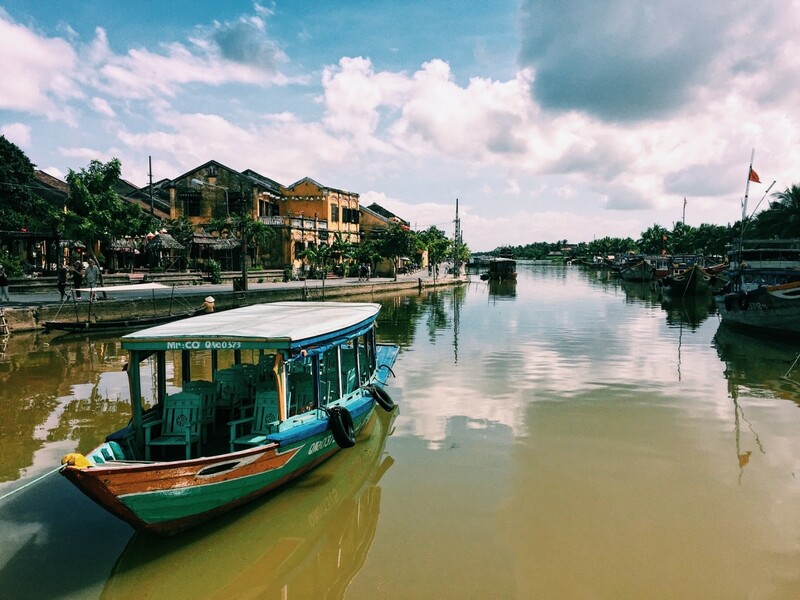 Located along the coast in mid-Vietnam, it is accessible by various forms of transport, Hoi An is a must for a 2 week trip to Vietnam. It is honestly one of the most stunning places I have ever been to, the old town especially is like stepping straight into a Disney animation. I recommend the Sunshine hotel for a place to stay that is a short walk from all the attractions and dining at the restaurant adorably called ‘I think you like’ located next door. 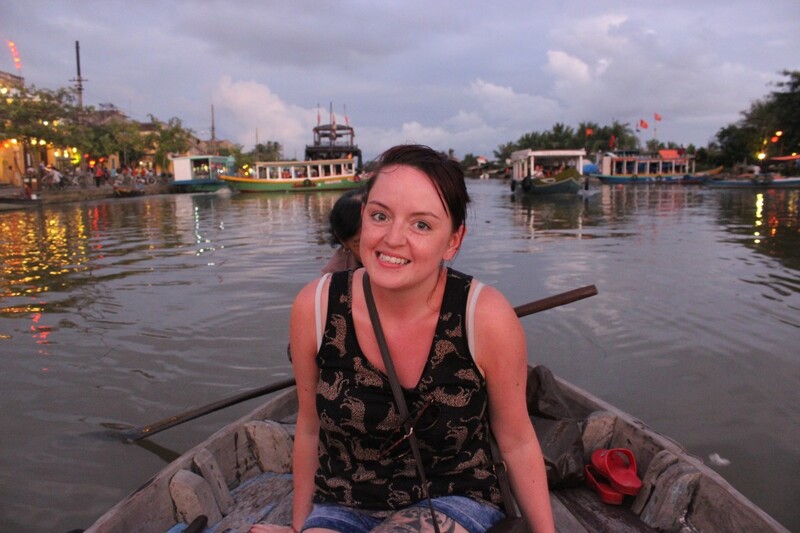 You can read my full Hoi An travel guide here. – Jump in a boat ride along the river and set off a floating lantern. – Relax with a massage. – Visit Henna art Hoi An for some beautiful hand-drawn henna. An alternative destination to Hoi An is Dalat, which is located further South, check out this 3 day Dalat itinerary to find out more. Located in the north of Vietnam, Hanoi is extremely busy like its southern brother Ho Chi Minh, it is also a complete contrast and completely worth a few days of your time. Part of Hanoi’s beauty is that you can walk everywhere, with many of the main attractions clustered near each other. A perfect example of this is some of the country’s most popular tourist areas – the Old Quarter is sandwiched between the two French Quarters. Like Ho Chi Minh, Hanoi is full of nightlife but in contrast, there is also a city curfew that is installed at 12 am, please respect this as it is enforced by the police. One of the bizarre things I noted in Hanoi was the shopping district, everything has a dedicated street! For example, if you need shoes, all the shoe shops are located on the same street and nowhere else, same with metalware, toy shops, etc. – Indulge in street food! Perch on a tiny chair and enjoy some of the best Pho in Vietnam along with an ice-cold beer. – Visit the Lantern lounge for dinner and drinks – I absolutely adored this place! – Take a walk around the Hoàn Kiếm Lake – In this area there are always school children that want to talk to tourists. This is simply because they want to improve their English. Please take the time to talk to them, they are lovely and are genuinely so interested in the tourists that come to their country. Halong Bay is the place on the postcards, the place most people think of when you say Vietnam and rightly so, no trip to Vietnam would be complete without it. 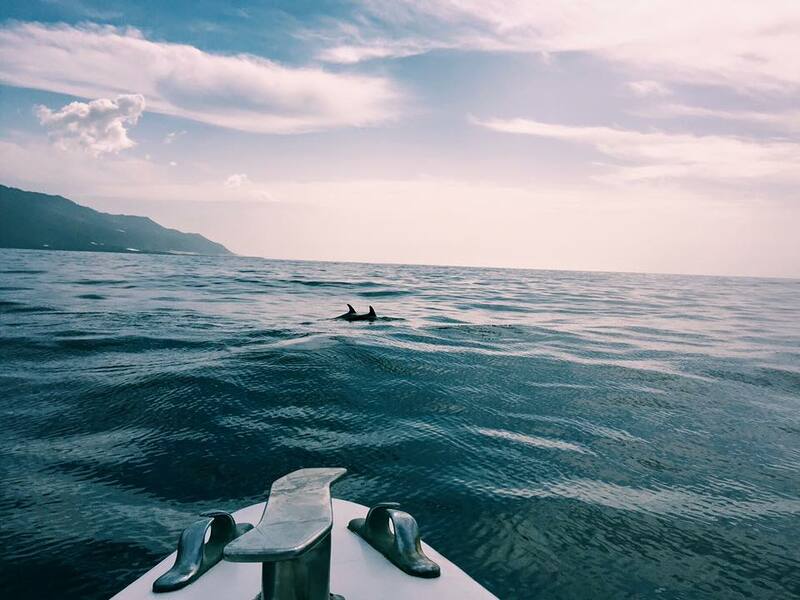 The serene bay is protected from swell, making it a peaceful sanctuary on the water. If the bay’s floating villages do not impress, the rocky outcrops that rise from the water will. Towering high above, these rock formations are an incredibly beautiful spectacle. Most tours will collect you from Hanoi before transporting you to the port where you will board the ferry. If you are short on time, the one night / two-day tour is enough to see it all, but if you have a spare night the two-night tour also includes a trip to Cat Ba Island as well. 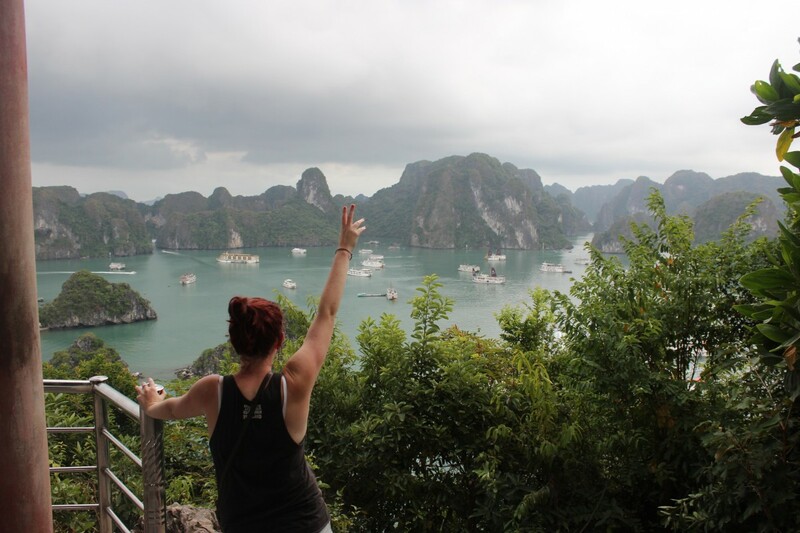 You can read all about my Halong Bay experience here, we booked with Golden Lotus tours, who I would fully recommend. An alternate option is Bai Tu Long Bay. Although Halong Bay is Vietnam’s most famous tourist attraction, Bai Tu Long Bay is less crowded. Both are fantastically beautiful, so you are in for a treat either way. While creating this post I actually found this Vietnam route planner, which shows you all the possible transport ways to get between cities as well as costs. This may save you a lot of extra time and stress. Located in the North of Vietnam, Sapa is known for the terraced rice fields of the Muong Hoa Valley. Please be aware, if you decide to travel to Sa Pa it is recommended to take malaria tablets. In Hue you will find Hue is the Imperial City, which is the enormous compound where the emperors lived and ruled their lands from. The hill town of Da Lat has long been the most popular location in the region for getaway holidays since French colonial times – many people call it ‘Le Petit Paris. Okay, so you have planned your route around Vietnam and hopefully, everywhere you are going to stay. Now you need to pack. Of course, you are going to need comfy travelling clothes which are also going to keep you cool in the ultimate Vietnamese heat, but what about the absolute essentials? Here is a quick summary of the absolute essentials you need to bring to on your trip to Vietnam. Jungle formula mosquito spray: There are tons of mosquitos in Vietnam, especially in Halong Bay. Do not ruin your trip, your photos and potentially your health but skimping on cheap bug spray. I always use Jungle formula wherever I go, it is expensive but it is one of the best. Reef-Safe Sunscreen: In Phu Quoc there are a ton of opportunities to go diving and snorkelling. 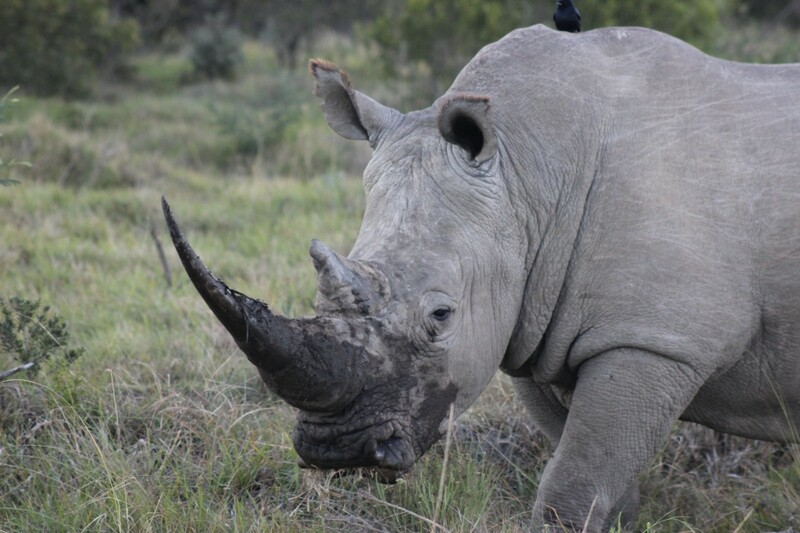 We need to remember to be responsible tourists. Help preserve that reef by wearing reef-safe biodegradable sunscreen when you go swimming or snorkelling. Many sunscreens are not reef safe and contain chemicals which are harmful to the reefs and the creatures which live in them. Reef-safe suncream is formulated to be safe to the oceans. Some places such as Mexico and Hawaii will not let you in the ocean without a reef-safe sunscreen, and if you are on an organised tour will check, so invest in a decent, safe suncream. Reusable stainless steel straw: Vietnam is notorious for single-use plastic waste. Continuing with the responsible tourist theme, invest in a reusable straw, I invested in this one and it folds down compact and comes with pipe cleaners to ensure it stays clean. When you get back from your trip just pop it in Milton for an hour and it will be sterilised to use it at home as well. Trespass 45L backpack: As you are going to travelling around I recommend a backpack over a suitcase. It is easier when moving in and out of cars and boats. When you are moving between hotels you can quickly chuck it on your back. I use a 45L litre backpack, which is one of the smaller side but works for a two-week trip, invest in a good brand such as Trespass and it will last you well, here my review of the Trespass Inverary 45L Rucksack. If you are using a top-loading backpack then packing cubes are essential. In fact, I use packing cubes on every trip now regardless of whether I use a backpack or a suitcase. Out of the countries I have visited in South East Asia, so far I have found Vietnam to be the cheapest. The average cost of meal for one in restaurant in Vietnam is around £4-6, with street food costing as little as £1. 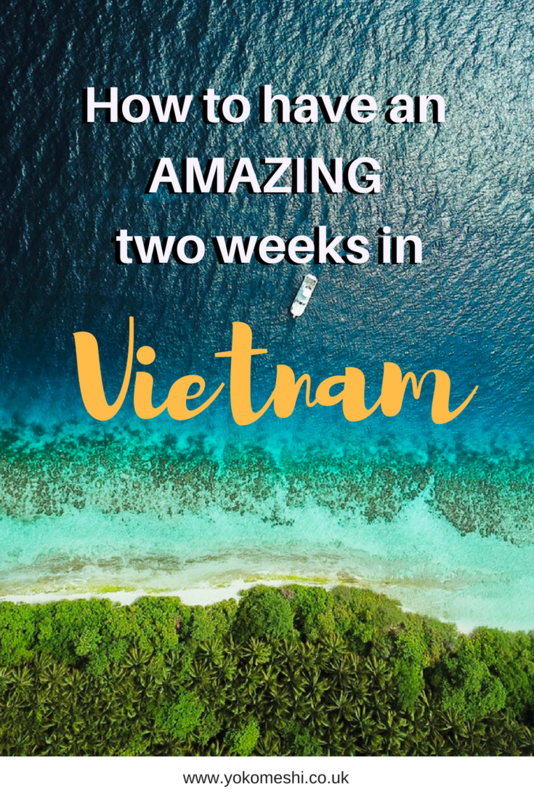 I spent two weeks in Vietnam and spent roughly £700 including excursions, shopping and scuba diving (all accommodation and flights were bought before arriving in Vietnam – including international flights, the cost around £800 each). Therefore the total I spent was around £1500, it is possible to do it for much cheaper than, however this is what I budgeted for the trip and therefore was happy to spend it. 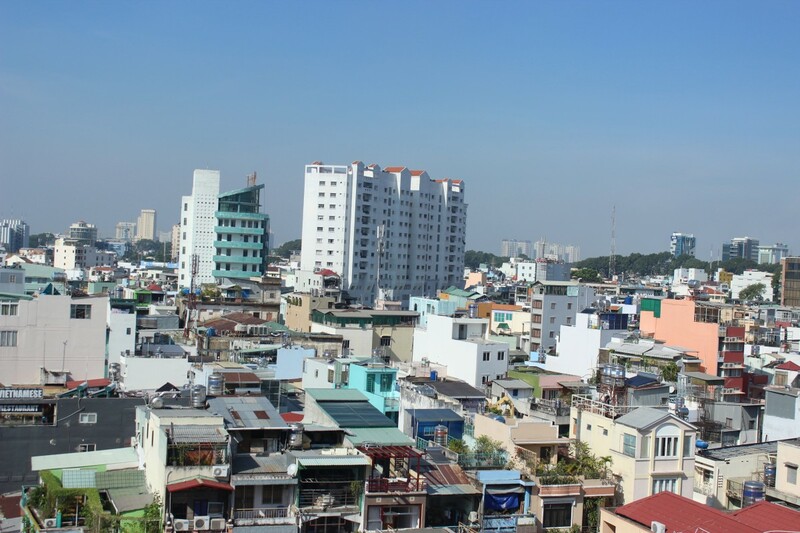 I also decided to fly into Ho Chi Minh and out through Hanoi to save on travelling time – however, this obviously meant an increased international flight cost. Again, weigh up the times versus cost when deciding on your options. I never once felt unsafe when travelling in Vietnam, if anything the people are the most welcoming and friendly I have met across South East Asia so far. I did have some anxiety issues in Hanoi but this was only because it was too busy for me at times. I can be incredibly sensitive to noise, and I believe the combination of moped noise, busy streets and heat at times became slightly too much for me, but never once did I feel unsafe in any part of Vietnam. For context, I travelled with just my boyfriend, we opted to stay in budget hotels and we had evenings where we were out late and would walk back to our hotels as opposed to using taxis. Like a lot of South East Asia, vegetarian food is easily accessible in Vietnam. They cook with a lot of Tofu and when cooked in with lemongrass you get some really amazing flavours. Of course, Vietnamese Spring Rolls are incredible. I did not struggle at all with eating while in Vietnam, however, I did find it difficult to find a good Vegetarian Pho. Be aware a lot of Vietnamese dishes are cooked in fish or meat broth, just mention you are vegetarian and many will understand, alternatively look for the words ‘Com Chay’ on a menu which means vegetarian. 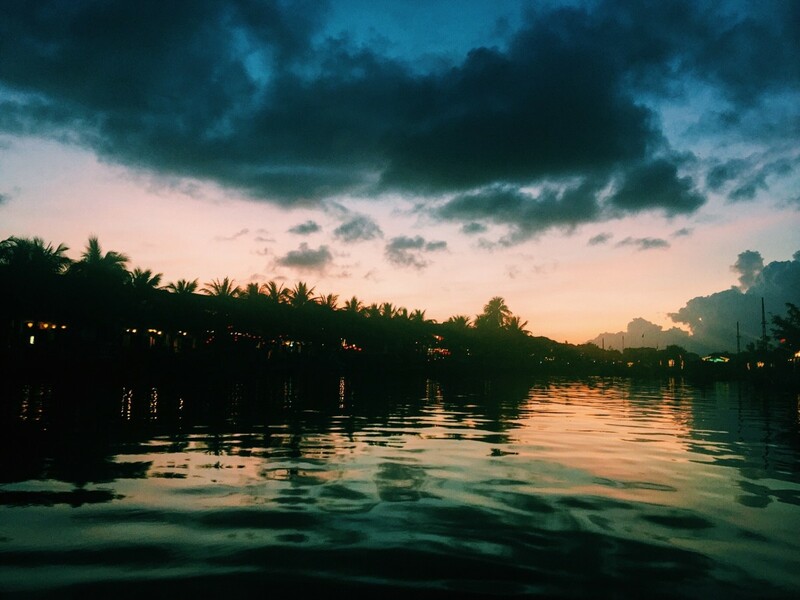 Vietnam is a beautiful country, with even more beautiful people, at all times I felt completely safe and welcome. If you want to know any more about planning a two-week trip to Vietnam please feel free to contact me. We went to Saigon a few years back – it was crazy but amazing at the same time. For the Halong Bay tours leaving from Hanoi do you get much time to take pictures and to that viewpoint where you took your picture above? Do you also sleep on the ferry? Finally would a two day tour include leaving on 1 day and return on day 2 or is it more like 3-4 days including travel from Hanoi? Hi! Thank you so much for posting this. What would you recommend for transportation between each site? My boyfriend and I fly into HCM at the end of November and we’re currently trying to plan our itinerary! Hi Elizabeth, it really depends on how much time you have, if you are short of time (2 weeks) then fly however if time is not an issue I would recommend train to really get more of an experience. Have a wonderful time! How did you handle the language barrier? Do many people speak English there? We generally go with a tour when we visit non-English soeaking countries because I’m always unsure how I would communicate without a guide who speaks the language. Thank you for such an informative post. I have a few questions I hope you will be able to help me with if that’s ok? 1) Do you recommend a suitcase or backpack for the same itinerary minus Sapa? 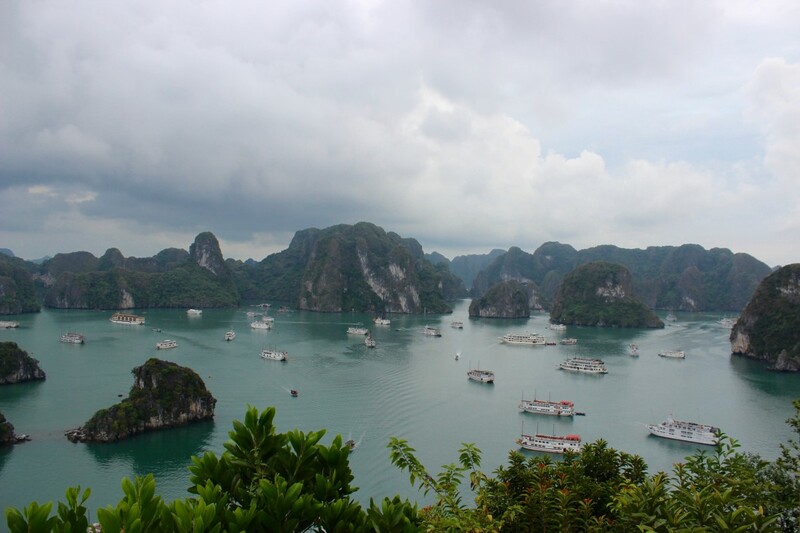 2) We were looking at the luxury boats for the Halong Bay tour, would you recommend they be booked in advanced? 3) Do you know if it would be possible to get the tour bus from Hanoi to Halong Bay, but then return to Haiphong instead? 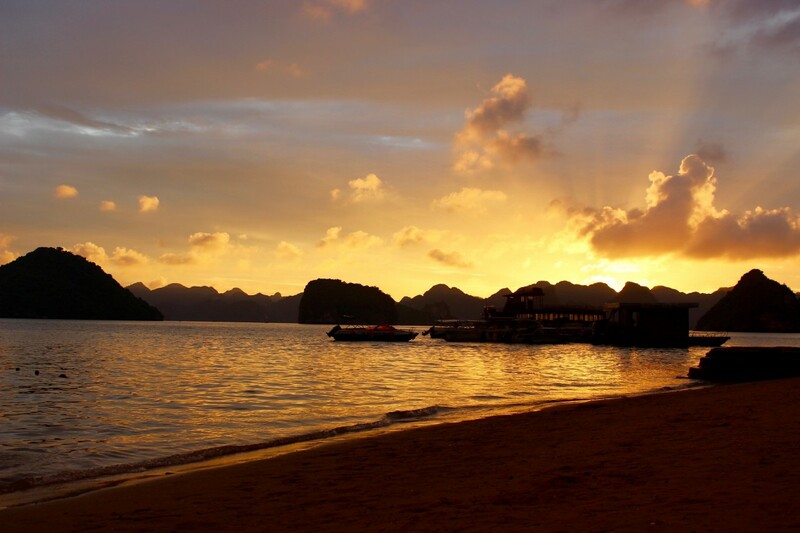 4) What time roughly do the 1 night Halong Bay tours generally finish? Thank you so much in advanced. It was so fun to find your post as we’ve been to VietNam three times and also stayed at Thanh Kieu In 2005. It was great to read that it still seemed relatively undeveloped! We enjoyed the wonderful beach there though the massage ladies were warring over territory at the time. When we were there there was a wonderful beach restaurant right below our room that everyone was trekking to. It was owned by locals and had the BEST beach food anywhere ever.